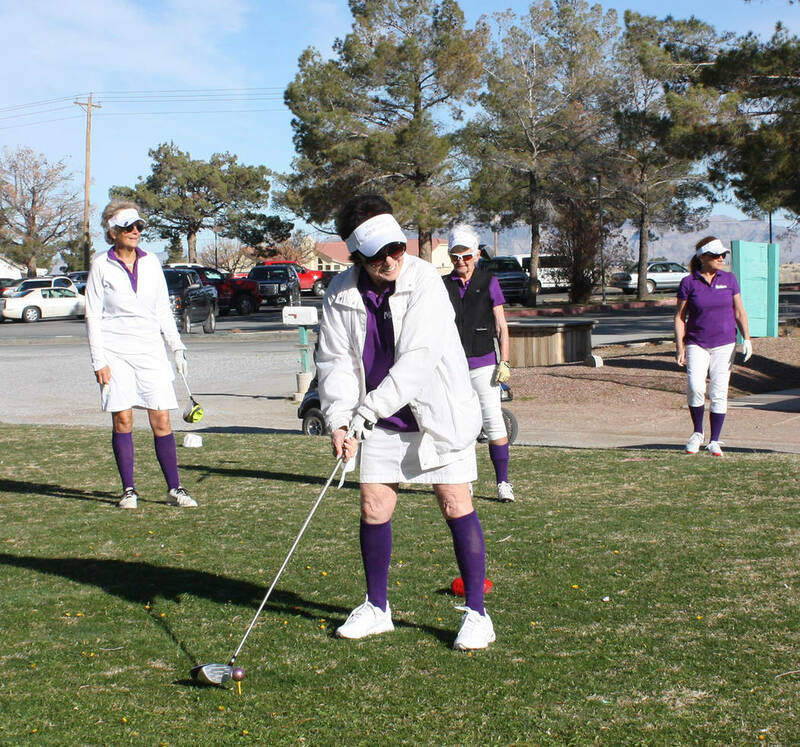 The Nevada Silver Tappers and Ms. Senior Golden Years USA organizations are well-known in Pahrump for their many events and their participation in countless others, as well as their dedication to giving back to the community. Robin Hebrock/Pahrump Valley Times Pictured from left to right are Robyn Butler, B.J. 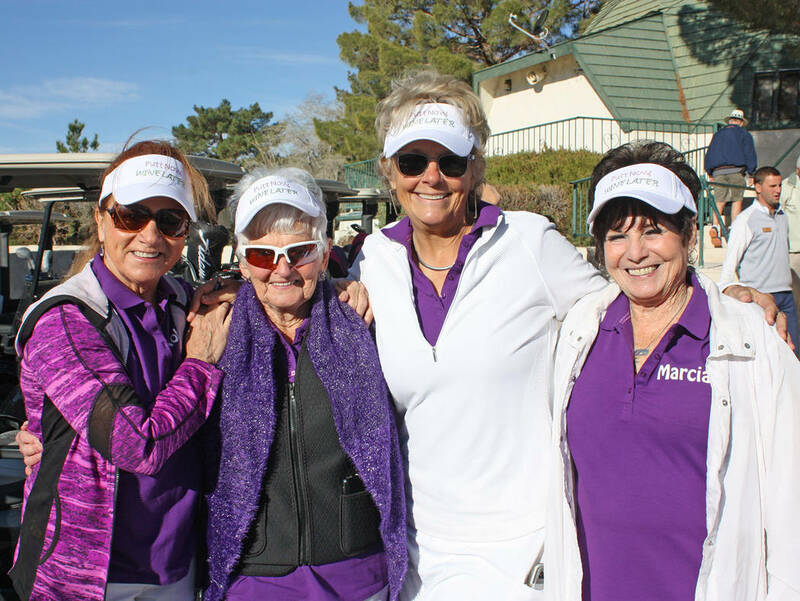 Hetrick-Irwin, Michelle Caird and Marcia Walling, one of the teams of four participating in this year's charity golf tournament, sponsored by the Nevada Silver Tappers and Ms. Senior Golden Years USA. 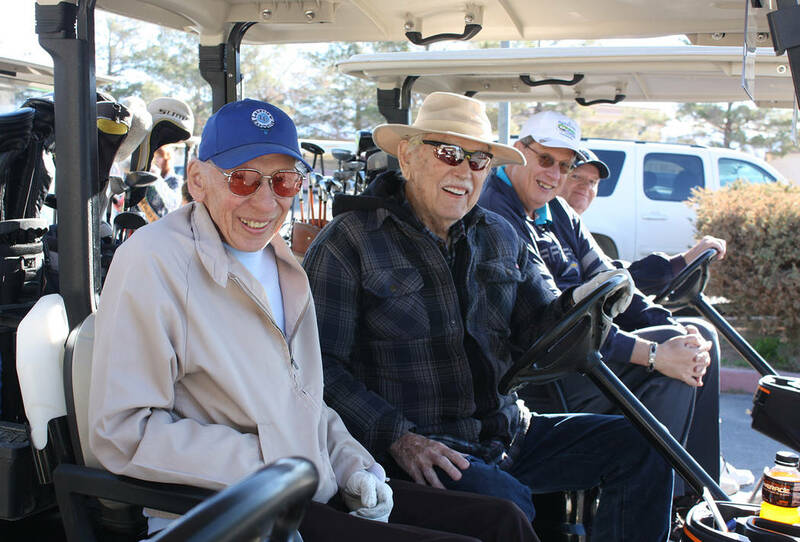 Robin Hebrock/Pahrump Valley Times Taking home third place in the golf tournament held March 23 was the team composed of Charlie Nawara, Roy Barnes, Oliver Gruter and Ray Kelmis, shown from left to right. 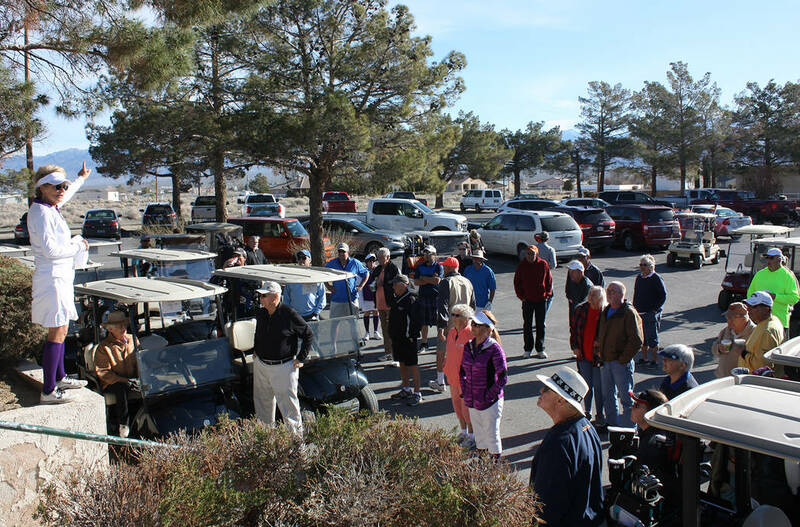 Robin Hebrock/Pahrump Valley Times A crowd of supporters gathered at the start of the Nevada Silver Tappers and Ms. Senior Golden Years charity golf scramble. Robin Hebrock/Pahrump Valley Times Pahrump Valley Public Transportation Supervisor Eric Whalen explained the importance behind the local transit service and offered thanks to all who had come out to support the golf tournament, with half of the funds raised earmarked for donation to the service. Robin Hebrock/Pahrump Valley Times Nevada Silver Tappers and Ms. Senior Golden Years founder B.J. Hetrick-Irwin tees off at the first hole. 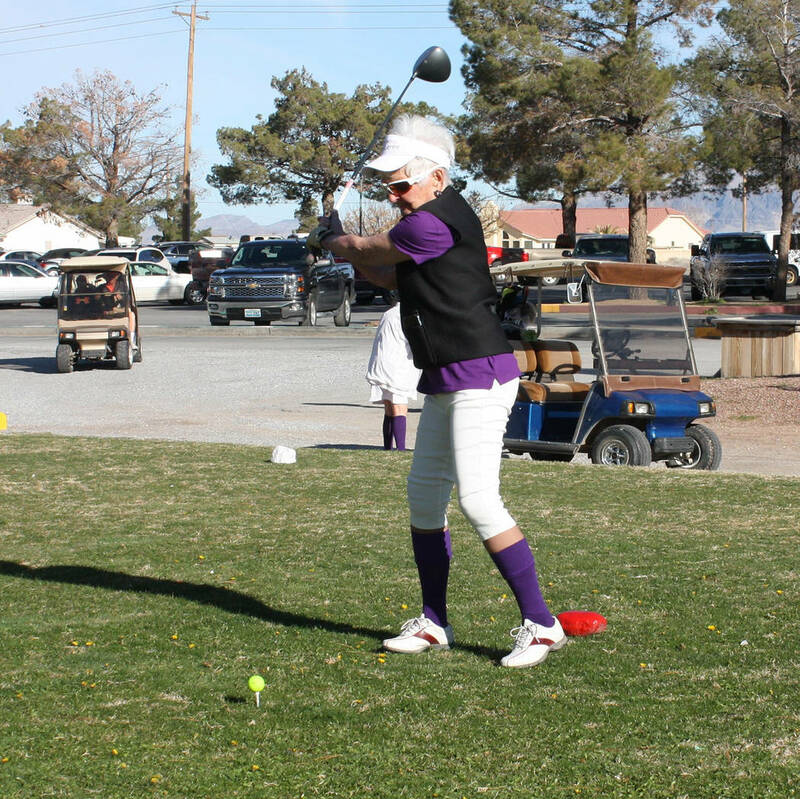 Robin Hebrock/Pahrump Valley Times Marcia Walling prepares to take her first swing in the charity golf tournament. Every year for the past six years these sister organizations have worked together to host their annual Golf Scramble fundraiser, selecting a different valuable nonprofit to benefit from the proceeds each time. 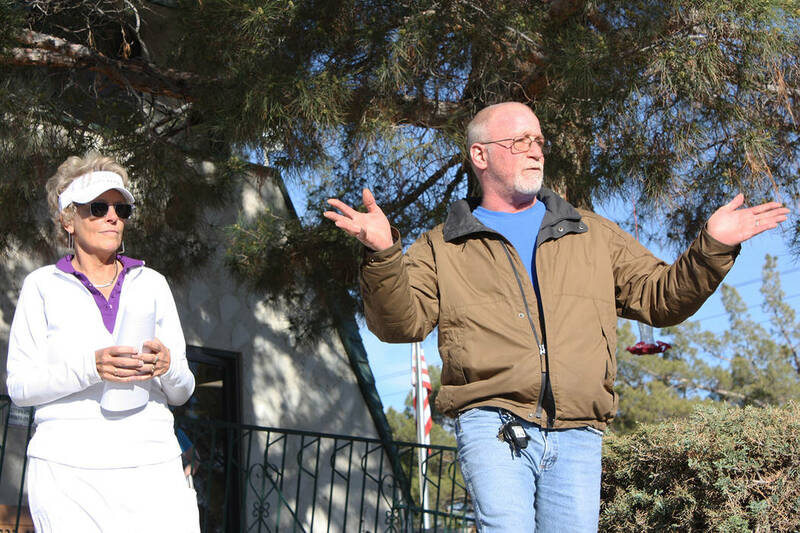 This year, the fundraiser was geared toward boosting Pahrump Valley Public Transportation, a local transit program that offers demand-response service for members of the valley. While this year’s tournament, held March 23, was somewhat smaller than in years past, event organizers said it was nonetheless a success, raising a total of $1,000. Transportation program supervisor Eric Whalen said he and the transportation team couldn’t have been more thankful for the support shown by the two sponsoring organizations and the community as a whole. “On behalf of everyone here at PVPT, I’d like to thank each and every one of you who participated and contributed to these wonderful organizations. We are still overwhelmed by the success of our program and even more by the public support we’ve received. Thank you,” Whalen stated. The event may have been a fundraiser at heart but there was plenty of competition involved as well, with prizes at stake for the winners. Taking first place this year with a score of 53, six under par, was the team comprised of Paul Claypool, Bob Steward, Art Murphy and Gene Bulac. Second place went to Tony Carlo, Tim Carlo, Mike Carlo and Chris Dambacker with a score of 54. Third place was a hotly-contested race, Caird said, with six teams coming in at a score of 57. In a card-off, the third-place award went to Charlie Nawara, Roy Barnes, Oliver Gruter and Ray Kelmis. Caird noted that events like this cannot be accomplished without the help of many others and she offered appreciation for those who helped make the charity golf tournament a success. “Thanks to our sponsors and supporters Tom Saitta of Saitta Trudeau Chrysler Jeep Dodge, Jewelry by Michael, CoreCivic, Paul Foster, the Pahrump Tourism department and Visit Pahrump, Sanders Family Winery, Sunflower Fashions, Pahrump Family Dental and Dr. Albert Ruezga, Dot Ahrens and Mary Kay cosmetics, and a special thank you to the Lakeview Executive Golf Course staff and all the Nevada Silver Tappers and Ms. Senior Golden Years USA members,” she concluded.